L'Avant Comptoir. Photo by Alexander Lobrano. We are thrilled to welcome Alexander Lobrano, Gourmet magazine's European correspondent from 1999 until its recent closing, as a regular contributor. Lobrano has written for almost every major food and travel magazine since he became an American in Paris in 1986. He is the author of "Hungry for Paris" (Random House), his personal selection of the city's 102 best restaurants, which Alice Waters has called "a wonderful guide to eating in Paris." Lobrano’s Letter from Paris will run monthly in Everett Potter’s Travel Report. Visit his website, Hungry for Paris. So "Jamin" is back, sort of. Or actually it's not. Instead, restaurateur Alain Pras has chosen to revive the name of the restaurant that propelled Joel Robuchon to international renown when he won his third Michelin star in 1984 and which went dormant when a short-lived Caribbean restaurant (La Table de Babette) occupied the space for a few years, but relaunch it in the ilk of the Guy Savoy bistros where he worked for many years (La Butte Chaillot, etc.). Though the new Jamin occupies the same space at the same address in the 16th arrondissement as Robuchon's place, this maneuver struck me as a rather cynical and manipulative before I went off to dine here the other night. It's just such as obvious attempt to glean some of the lingering magic of a restaurant brand name that still elicits a glimmer of recognition everywhere from Tokyo to Topeka. Arriving, the only recognizable feature of the original restaurant is the charming oeil de boeuf in the facade. Inside, the formerly rather elegant dining room has been recast as a rather dimly lit modern bistro with bare wooden tables and contemporary art on murky chocolate brown walls. It's a very eighties look, and the menu brought back this decade in the most deja vu of ways, too. A perfect example is the lightly seared red tuna start rolled in tandoori spices. Since I couldn't dissuade the English banker husband of the old friend whom I'd met for dinner from ordering it I alluded to the fact that red tuna is almost extinct, but he facetiously reasoned that whatever he'd be eating that night had already been fished, I had a chance to taste it, and it was impeccably done, but just so wrong. A pair of vaguely better starters were Amanda's mesclun salad garnished with tempura shrimp in a honey-soy vinaigrette another Guy Savoy bistro classic, and my soft-boiled egg with piperade and Basque ham. To be sure, chef David Legrand, 27, is a very able cook, and overall, we had a good dinner main courses of sea bass with Thai rice and a curried coconut sauce, guineau hen with chestnut risotto, and rack of lamb with pommes dauphinois were all well made and tasty, but aside from a truly superb Paris Brest for dessert, there was nothing about this meal that I'll likely remember in a month's time, and nothing about this restaurant that would make it worth traveling across town for. In stark contrast to "Jamin," I can't get to brilliant bistro chef Yves Camdeborde's new L'Avant Comptoir often enough. Camdeborde opened this new Basque-Bearnais hors d'oeuvres bar next to this perpetually booked Le Relais du Comptoir a couple of weeks ago, and it's been packed ever since. Why? It offers the best fast, on-the-hoof eats on the Left Bank think sublime ham croquettes, grilled cepes mushroom caps with garlic chips and parsley, shots of seafood bouillon with shellfish, incredible charcuterie, great wines by the glass, and an unfailingly fun crowd. 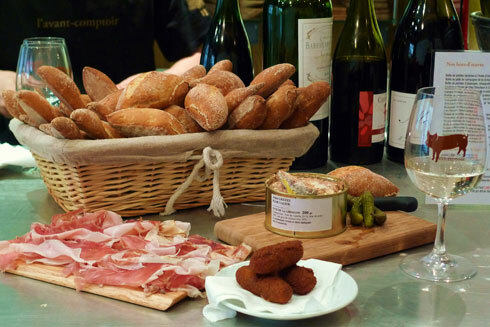 L'Avant Comptoir is an ideal place for a quick lunch, light dinner or snack and very happily, it's open daily. 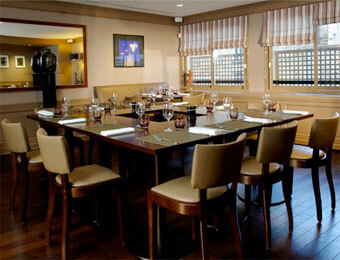 Jamin, 32 rue de Longchamp, 16th,Tel. 01-45-53-00-07. Metro: Iena. Mon-Friday noon-2.30pm, 7-10.30pm. Avg 50 Euros. L'Avant Comptoir, 9 carrefour de l'Od on, 6th, Tel. 08-26-10-10-87. Metro: Odeon. No reservations. Open daily.